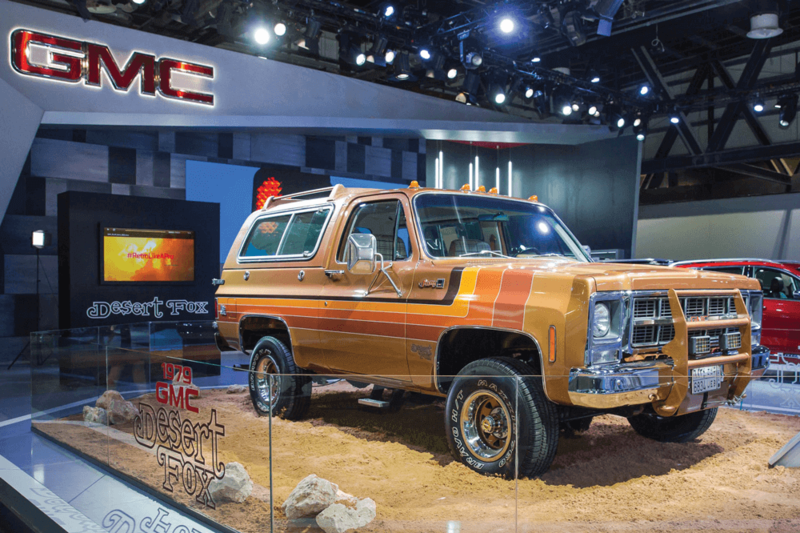 SUICIDE DOORS, SIDE-SWINGING TAILGATES AND HEADLIGHT grafts have all seen their heyday come and go, but as always, there are new trends emerging in the custom truck world. The truth is, wild body mods aren’t as common as they once were, with many builders choosing to focus their attention on other areas. So, what’s the cool guy thing to do in 2018? 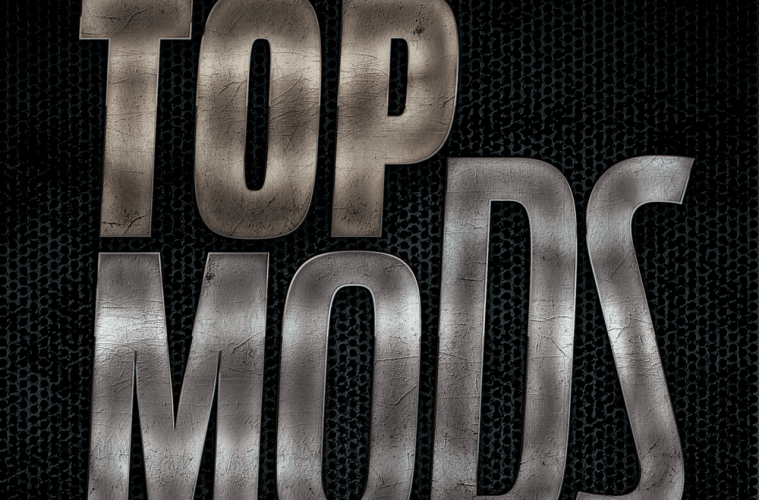 Well, we’ve compiled a list of what we think are some of the sweetest mods trending of late. 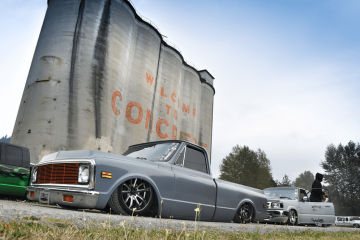 Even without the abundance of body mods these days, there are still plenty of awesome things being done to C-10s of all generations. 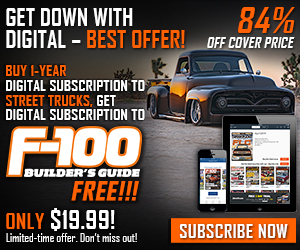 SWAPPING 1967-68 front ends on 1969-72 trucks has been a thing for as long as we can remember, but now one of the cool things to do is to put 1973- 80 front ends on 1981-newer trucks. Why is this weird? 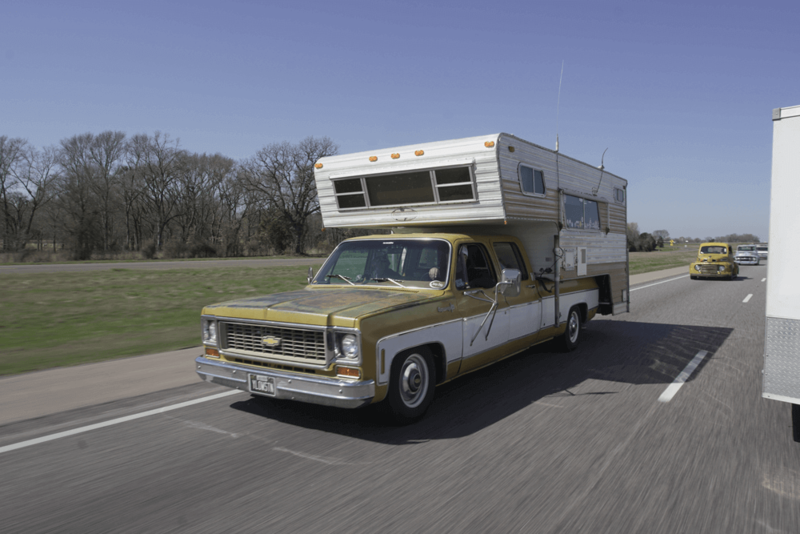 Well, up until a few years ago, everyone was swapping 1989-newer RV and Blazer/Suburban front ends onto anything older. We guess that with retro everything being all the rage now, 29-year-old front ends are just too new. IT may seem like old news to some, but patina as a style choice over a fresh paint job is still a relatively new phenomenon. Apparently, the more neglected the finish the better. We get the appeal of not having to worry about scratches, and we definitely love seeing a truck’s history worn on its sleeve. Some love the look so much that they fake the funk with faux patina. We’re still torn on that, but we’re not the ones forking out the cash. Just as long as trucks are still getting built, we’re good. 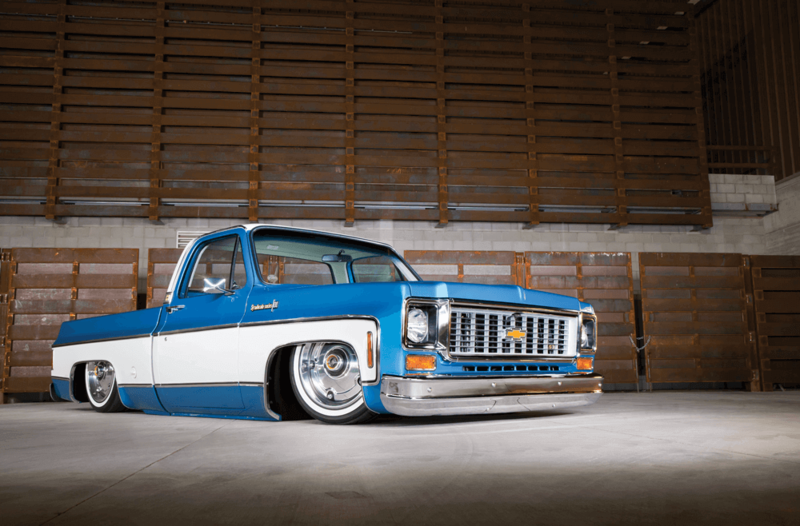 NARROWED axle housings are becoming the norm these days, allowing the use of ultra-wide rollers, and 12- to 15-inch-wide wheels are not uncommon on many modern builds, including C-10s. Make no mistake about it, though, this is a costly way to go. 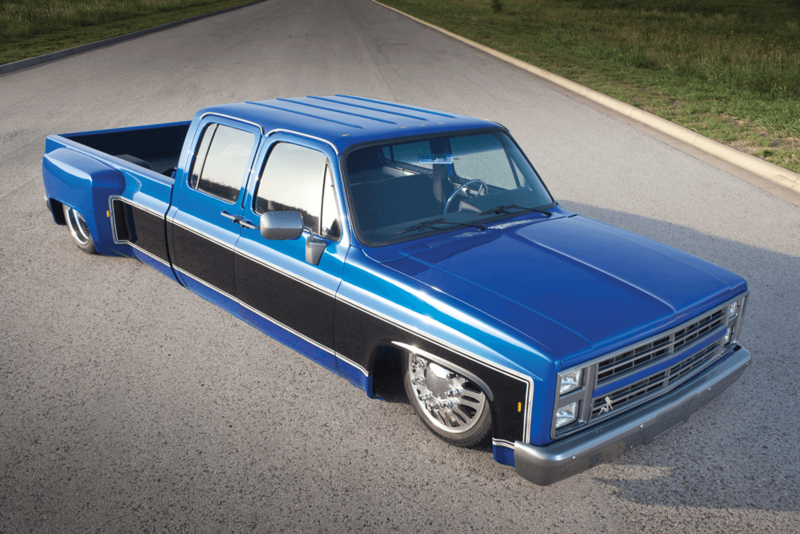 Aside from the narrowed rearend, custom width and offset billet wheels will set you back plenty of hard-earned dollars. Will this trend stand the test of time? 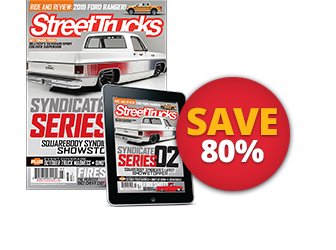 We’re not sure, but we do know what happened to the pro street look many moons ago. 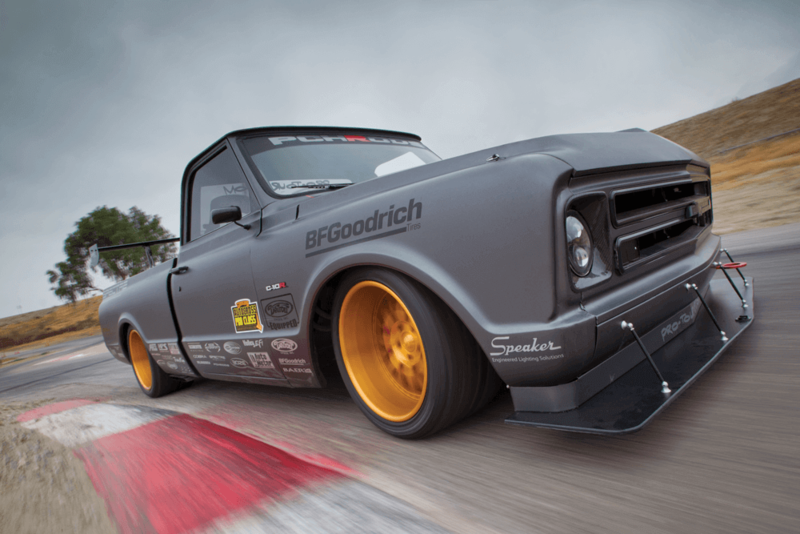 WHETHER it was Delmo who started things off with his LS dress-up parts and supersized retro-style wheels, or Joe Yezzi with the “stock” billet GSI steering wheel in his Syndicate Series 01 truck, there’s a whole lotta nostalgia going on these days. Many vintage design elements are being incorporated into modern builds, with features that bring them into the 21st century. AS much as we want to put LS swaps on the list as being hot ’n’ trendy, they’ve become so mainstream that they’re just part of the scene now. 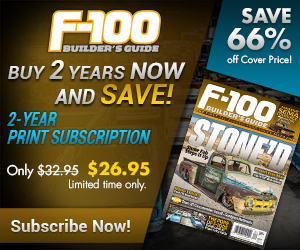 Making diesel power is the next big thing. Cummins seems to be the make of choice for many, but Duramax engines are also fair game for those who want to keep it in the family. For big torque and big smoke, you can’t beat a proper diesel power plant. LONG a staple in the muscle car scene, another big thing these days is to have a completely stock body (and interior) with a modern chassis, suspension, wheels and drivetrain. 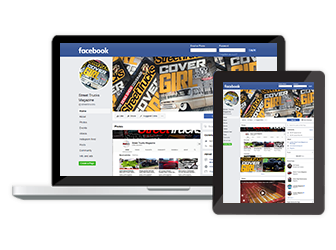 The result is clean, classic lines with the latest in technology and modern-day conveniences. What’s not to love? FOLKS have always spent a ton of money on their classic trucks, but it’s still kind of weird to see square-bodies getting full-on, frame-off rotisserie builds. Whether it’s a 100-point concoursquality restoration or a Ridler-esque custom job, squares are getting their just desserts. 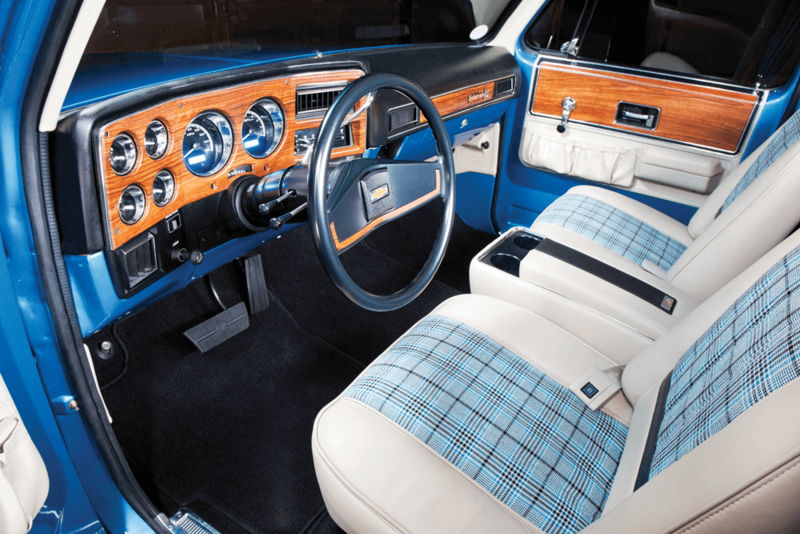 The fact that a well-executed example can fetch $100k-plus on the auction block is proof positive that square-bodies have earned some proper respect. THE awesome thing about owning a C-10 these days is that there is so much available for all three generations. 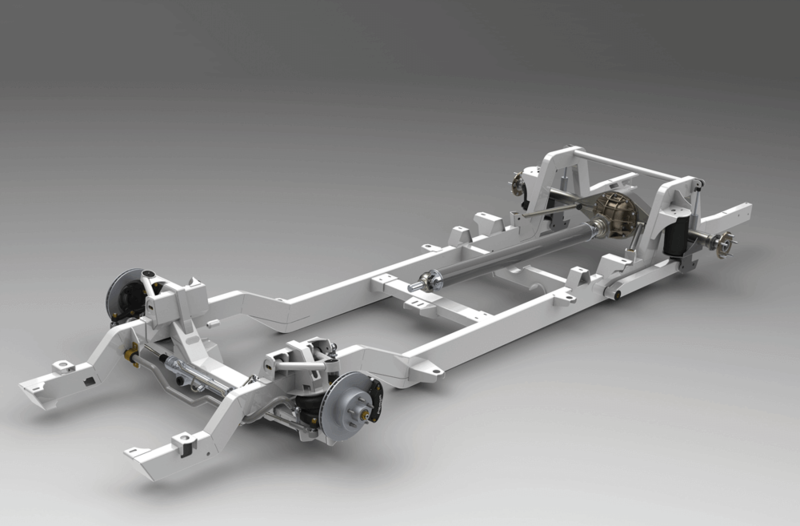 From restoration parts to complete chassis, you can literally bolt a complete truck together these days. 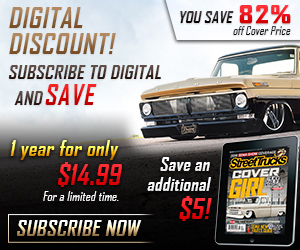 Of course, you can still go as one-off crazy custom as you want, but it’s a beautiful time to be alive when you can pick and choose parts that you can install in your own garage if you want to. 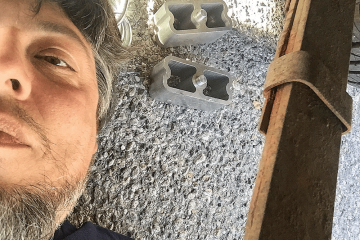 Besides saving some money (in most cases), there’s peace of mind in knowing that plenty of R&D has gone into these parts, with little guesswork involved. WHETHER it’s a bobbed bed, a utility bed or a full-on RV, anything goes when building the back half of a C-10, C-20 or C-30 these days. 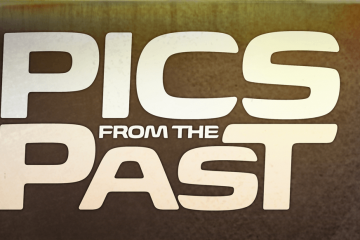 In the past, just about anything besides a short-bed was frowned upon (the dually guys could get away with a long-bed), but today there’s no shortage of ideas for trucks that were once just thought of as parts vehicles. 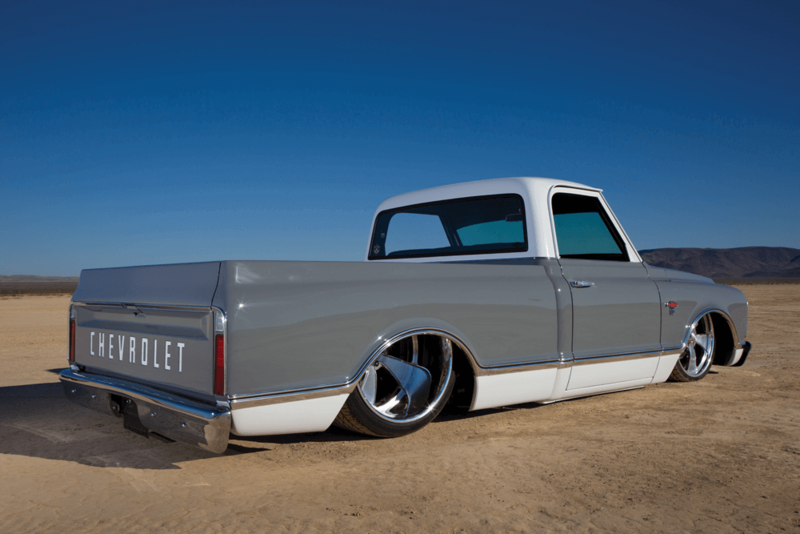 FROM Indy haulers to Beau Jameses and Gentleman Jims, oldschool, limited-edition trucks—especially square-bodies—are white-hot these days. 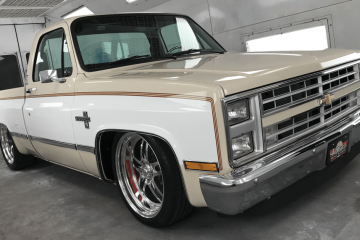 Some folks are building the originals, but with aftermarket replica graphics and accessories becoming more readily available, it makes sense that a lot of regular trucks are being built to look like more highly sought-after models from years past. Always wanted a Blazer Chalet that Cha-lays body? Go for it, dude! 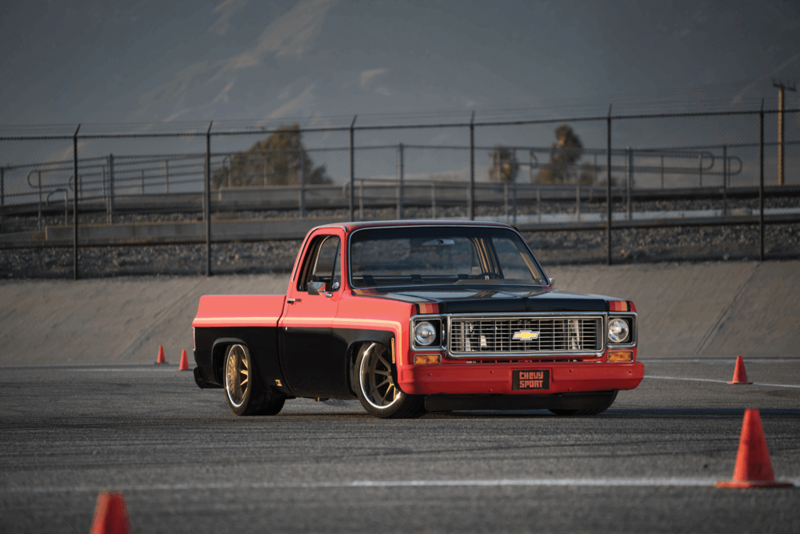 Autocross and road-course trucks are becoming more of a thing now, thanks in large part to aftermarket companies that are making it easy to get our trucks to handle better than ever. 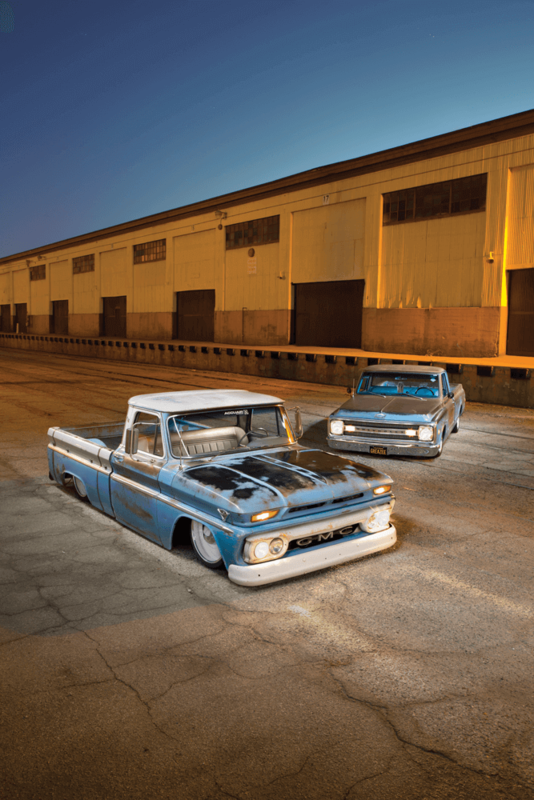 Coil-over setups, bolt-on 4-links, performance sway bars, tuned leaf springs and custom-valved shocks are just some of the trick items available to completely transform your C-10’s abilities. Remember the “Dukes of Hazzard” theme song, “Straightenin’ the curves, flattenin’ the hills …” twisties are fun when your truck is equipped to handle them.